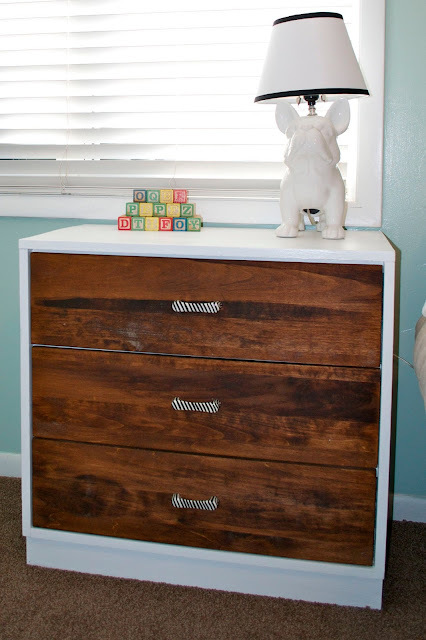 Remember the bear dresser that we've been working on refinishing? Well it isn't finished yet... but it's close. To remind you (since this project has been going on forever) this is what the dresser has looked like for the past 25+ years. After sanding, staining, priming, painting and adding new pulls (zebra ones to be exact) the dresser now is sporting a whole new look. I still need to put the bears back onto the front, but I haven't quite decided on the layout yet. We are really trying to use what we have when we can so we can save money for larger purchases that we have to make, so besides the handles, this was another free project. Even though it took a long time to refinish, it was totally worth the time and $7.50 in new handles to get a "new" dresser instead of just buying the one that "went" with our crib (that dresser is $399!). 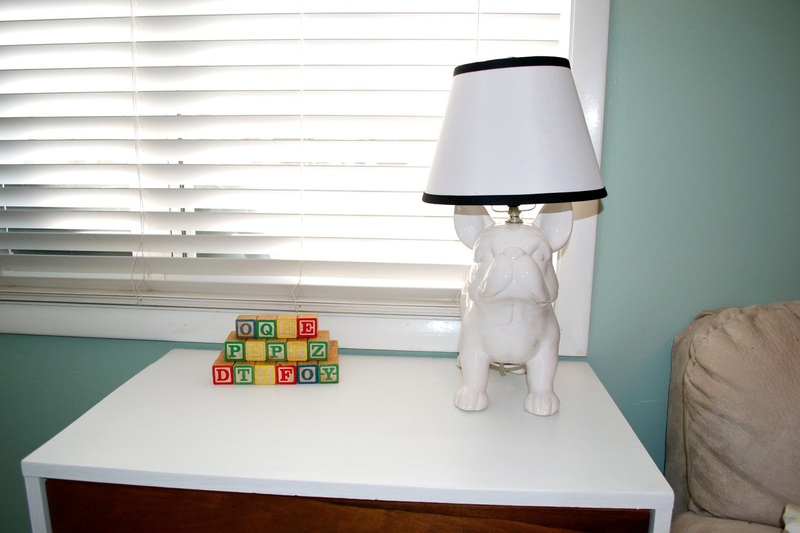 As we show you more of the nursery, you'll notice a few things that keep reappearing. One is the white with dark wood and the other is animals. We didn't want a super strong theme for this room but we did want it to be cohesive and who doesn't love animals? There are a lot of little animal touches in the room that we'll show you but two of my favorite are the zebra handles (we found them at Hobby Lobby) and the dog lamp (Target). 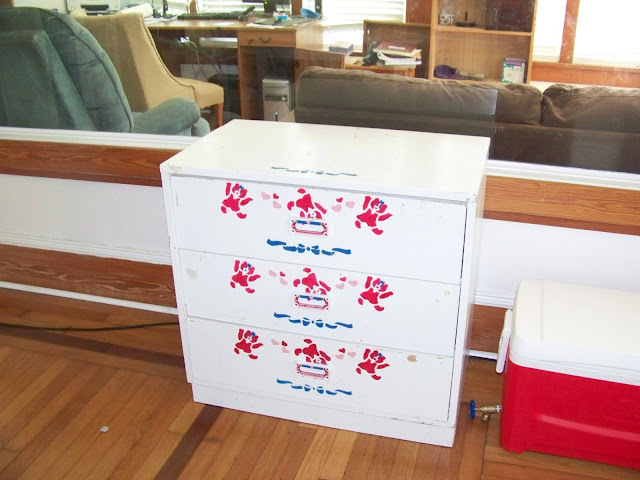 You'll see the zebra handles again in the room and they add a nice little touch of fun to the dresser. The dog lamp was a semi-tough purchase. We got him months ago and even though he was on sale, he still was $30. (can anyone explain to me why lamps are so expensive??) 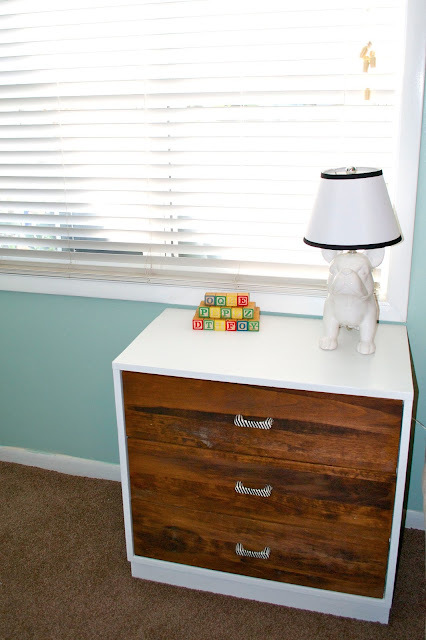 I found him, carried him around for a bit and ended up putting him back since it was early in the pregnancy and we had no idea what we were having yet and thirty bucks was a bit much to spend on a lamp that, to us, was more of a boy lamp. Well, he lasted on the shelf until I saw someone else checking him out (he was the last one). 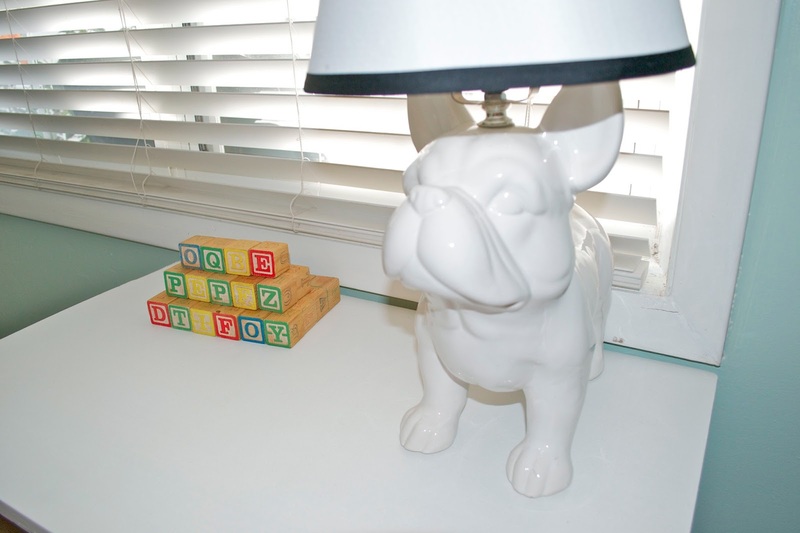 At that point I decided we had to get him so when he was put down I marched over, snatched him back up and bought him (and got laughed at by the checkout guy... he obviously didn't appreciate the awesomeness the dog lamp would bring to this room). Since then, he's been stored away waiting for his place in the baby's room. Now he has a spot on our refinished dresser right next to the couch ready to take on the task of providing just the right amount of light when we need it. So there you have the first little peak into the nursery furnishings. We are slowly feeling more organized in this room but we're not quite there yet (who knows if we really ever will).